All windows have a variety of options to choose from. Be sure you are familiar with all the options to achieve the look you want. If you are looking for an affordable, easy to maintain replacement window, single-hung windows are a great option. Single-hung windows are popular with many homeowners because they operate a lot like double-hung windows. 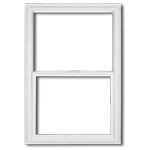 Our manufacturer builds high quality vinyl single hung windows to very high standards. But window styles go well beyond their look–window styles provide a functional difference, too. But window styles go well beyond their look–window styles provide a functional difference, too. Vinyl Single Hung Replacement Window by Simonton windows offer less frame and more glass than most replacement windows. The unique frame design provides maximum energy efficiency that far outperforms ENERGY STAR standards and helps you reduce your heating and cooling costs.